Our Maui No Ka Oi (Maui is the best) sauce is made with pure Trinidad Moruga Scorpion peppers and was first made for our Kickstarter backers. We were able to do another batch of this very flavorful and spicy sauce. If you like flavor and heat in your hot sauce, you’ll love Maui No Ka Oi. It’s like a hot candy in a bottle with no sugar added. It has a slightly sweet flavor with a hint of watermelon like flavors. Put it on just about anything. We love it on eggs, mac salad, grilled chicken, fried rice, noodles like Pancit, Saimin, Ramen, Chow Fun and it even works great to spice up your spaghetti. 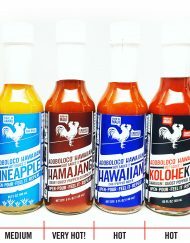 Our Maui No Ka Oi (Maui is the best) sauce made with Trinidad Moruga Scorpion (One of the hottest pepper in the world). If you like flavor and heat in your hot sauce, you’ll love Maui No Ka Oi. This one packs some heat! 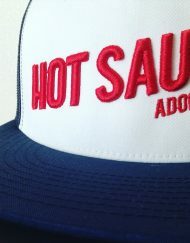 Great flavor, heat does not stay for a long time on the tongue like a lot of overly fire-y hot sauces do, which I liked. A little goes a long way. This is an absolutely awesome sauce. It is almost like a sweet and sour with the slight sweetness from the peppers and the sour of the vinegar. The heat of this sauce really kicks so be careful.